Celebrating the joys of utensil-free dining. There is a fair amount I don't know about dining etiquette. At fancy restaurants, for example, I can never quite remember where the soup spoon is supposed to be placed among the other utensils. But one thing I am sure of is that our distant ancestors—the first humans—ate with their hands. They were not concerned about when to use the small salad fork or where the butter knife should reside. And for this column, neither am I. This is a love letter to a few of my favorite handheld foods—so let's get down and dirty. The most satisfying—not to mention the most ginormous—cheesesteak I've gotten my hands around in quite some time is at The Philadelphian in Sandy (9860 S. 700 East, 801-572-3663, phillyutah.com). You won't visit this eatery for the décor; in that regard, it's similar to bare-bones cheesesteak emporiums in Philadelphia like Jim's and Tony Luke's. But, with cheesesteaks this fabulous, who cares? The meat—and there's lots of it in these overstuffed steak sandwiches—is perfect: lean and juicy with just a slight crisp around the griddled edges. The classic Philly cheesesteak comes in 4-, 6-, 8- and 12-inch sizes, with good quality hoagie-style rolls and sautéed mushrooms, onions and gooey Provolone. The name says it all At Gyro Gyro (2560 Bengal Blvd., Cottonwood Heights, 801-860-2483). This relatively new restaurant is well focused; it doesn't try to be everything to everyone. When I last visited, the menu consisted of lamb-beef gyros, chicken gyros, a veggie gyro, falafel, Greek salad, french fries, baklava ... and that's about it. But what you want is the generously stuffed lamb-and-beef gyro: tender, juicy and superbly satisfying. Bonus points for having Mexican hot sauces and Tabasco available. I dig the retro, black-and-white checkerboard-style décor of Johnny Slice (12 W. 300 South, SLC, 385-415-2924, johnnyslice.com), not to mention the convenient fact that it's just around the corner from City Weekly headquarters. For lovers of New York-style by-the-slice pizza, this is the place. The staff is super friendly, and the slices are large and fold properly, like a New York slice oughtta. There are custom whole pies available, as well as great roast pork, meatball and roast-beef sandwiches. But when you're craving a simple cheese slice like you remember from a visit to the Big Apple, set sail for Johnny Slice. Owned and operated by a family that immigrated to Utah from Azerbaijan, West Jordan's Doner Kebab Express (2641 W. 7800 South, Ste. C, 801-601-8181, donerkebabutah.com) is a terrific—and spotless—little gem of a restaurant. "Doner" is a Turkish word that refers to rotisserie-roasted savory meats, similar to gyro meat. Here, the doner kebabs are served as sandwiches on pita bread, as a wrap (the best choice) or as a full-sized meal with grilled veggies, salad and rice or fries. Unlike most gyro shops, which serve tzatziki, Doner Kebab Express also offers a tasty, housemade tomato-based sauce that I favor. According to its owner/founder, a pawned Fender Telecaster led to the founding of J. Dawgs (multiple locations, jdawgs.com). They keep it simple here: The menu consists of Polish or beef hot dogs, chips, drinks and condiments (onions, banana peppers, jalapeños, sauerkraut and pickles). 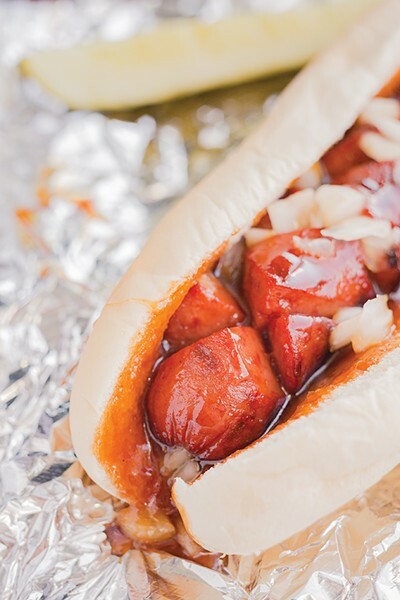 Served on locally milled buns, the all-natural Polish dawg with sauerkraut is a life-changer. They might serve only proletarian hot dogs, but these are some of the snazziest eateries around.